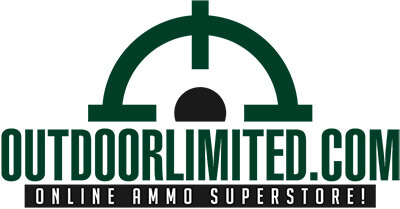 Outdoor Limited is the online ammo superstore to fulfill all your ammunition needs. We have a wide collection of ammunition for sale. We stock one of the best selections of ammunition. Trusted name for buying quality ammo from top manufacturers . Get more for your money. Best prices and fast shipping at your discount shooting supplier! We have a wide collection of affordably priced cheap ammo including; Rifle Ammo, Handgun Ammo, Shotgun Ammo & Rimfire Ammo. When you browse our inventory, you're seeing exactly what we have in our warehouse & ready to ship. No third party drop shipping and no backorders ever! Whether you need cheap ammo for target shooting, hunting or competition ammunition needs, Outdoor Limited have it all. We have special weekly deals available for : 9mm Ammo, 22lr Ammo, 223 Ammo, 5.56 Ammo and more. Searching for a bulk ammunition? Don't worry, We have low ammunition prices and the best selection of high quality bulk ammo for sale for those who want to save big by buying in bulk. Check for bulk ammunition availability in the product details!